If you're a Starlight Rewards member, you will be able to log in here. If not, you can just continue your booking as a guest. We will use this email address to send you your tickets and booking confirmation. We've noticed that your're using an email address associated with a Rewards account. Log in here to earn your rewards. Or if you prefer, continue as a guest. We have not found an email address associated with a Rewards account. Sign up for Rewards and earn points. Or if you prefer, continue as a guest. Got a voucher code? Remember to enter your code before selecting your tickets below. Once you've made your payment, we'll email your tickets and confirmation of your order to . You can either print your tickets, or collect them from your box office. Once you've made your payment, we'll email your tickets and confirmation of your order to the email address you've used to log in with. You can either print your tickets, or collect them from your box office. Want to pay with a gift card? 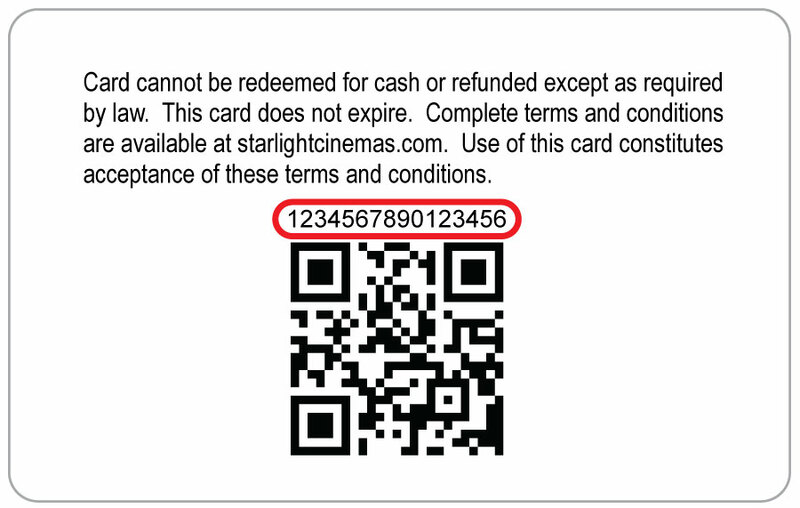 Your gift card number is located on the backside of your gift card above the QR code. Please enter the details of the card you wish to use to make your payment. Please select the card you would like to use to make your secure payment. I confirm I have read and agree to the terms & conditions. Print your tickets here or by using the email confirmation. Just bring along your booking number or bring the card you used to pay, and you can collect your tickets at your theatre’s box office. Please remember to arrive at least 30 minutes before your showtime.